Hello and welcome back to Frightful Fridays! Today's entry actually comes to you on Friday and is courtesy of Paizo friend Kajehase. The potoo bird is a weird looking thing, and I figured that weirdness would translate to some interesting abilities for a larger, more intelligent version. I hope you like the potoo bird, and Frightful Fridays! will be back next week with a new monster. Thanks for reading! This gigantic bird, whose pupils contract and dilate independently, seems otherwise unremarkable. It opens its toothy bill to let out a low, despondent cry. 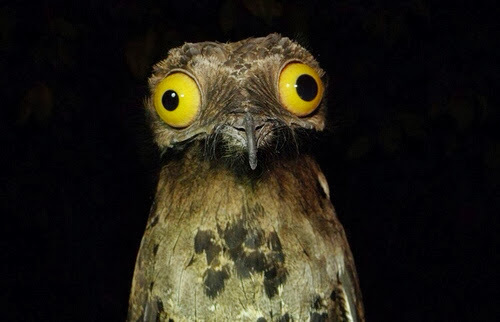 Afterimage (Ex) As part of a move action, a potoo raptor can dilate its pupils to their fullest extent to activate this ability; any creature engaged in melee with the raptor that does not avert its gaze must make a DC 18 Will save. If the creature fails, it believes the potoo raptor remains in the location from which it moved. This is a mind-affecting compulsion effect. The save DC is Charisma-based. Mournful Cry (Ex) The potoo raptor's forlorn cry causes despair in all who hear it. A creature within 60 feet of the raptor must succeed at a DC 18 Will save or become dazed for 1 round and sickened for 1d6 rounds. This is a sonic mind-affecting charm effect. The save DC is Charisma-based. The potoo raptor is a strange evolutionary throwback to the potoo bird, similar in some respects to the relationship between many prehistoric raptors and present day birds. However, the potoo raptor has extra abilities beyond its extraordinary size and camouflage that allow it to more easily hunt prey, especially intelligent creatures. A typical potoo raptor specimen stands 5 feet tall and weighs 200 pounds. The potoo bird's haunting call becomes much more powerful in a potoo raptor; the raptor's cry brings forth a sense of ennui in those who hear it, causing them to become listless and not quite as able to resist the bird's attacks. Typically, a potoo raptor establishes its home in a forested or jungle area near a small settlement. It sits on a tree branch or stump, where it camouflages itself, and waits for intelligent prey to wander through its territory. A single potoo raptor prefers to attack one or two humanoids at a time, but, if hungry enough, the bird will attack larger groups. The potoo raptor's other ability to create an image of itself in the mind of nearby foes allows it to escape from more powerful creatures. Additionally, a pack of raptors uses this ability to confuse opponents into attacking figments of their imagination while the pack circles around and attacks the unsuspecting foes. Rarely, a druid or ranger will raise a potoo raptor as a hunting companion or to defend the druid or ranger's home. A potoo raptor egg sells for 500 gp, while a trained bird sells for 5,000 gp. Welcome back to a late (or early, depending on how you look at it) edition of Frightful Fridays! This week's entry features a deadly weed that will slice, strangle, and otherwise murder you, when it isn't looking for someone to unwittingly carry seeds to infest a new area. 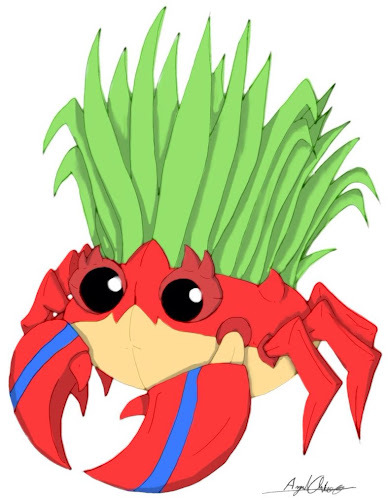 I couldn't find an illustration that appropriately demonstrated killer grass (go figure), but I came across this adorable depiction of crabgrass. I plan to do something with this guy later, but, for right now, I wanted a deadly plant. I hope you enjoy this week's monster, and I'll be back later (hopefully, actually on Friday) with something new. As always, thanks for checking out Frightful Fridays! Bones that have been picked clean are tangled in this large weed clump; the weed's grassy blades unfurl as it frees itself from its roots, making a popping sound. Camouflage (Ex) Since slaughtergrass looks like a normal plant when at rest, a DC 24 Perception check is required to notice it before it attacks for the first time. Anyone with ranks in Survival or Knowledge (nature) can use either of those skills instead of Perception to notice the plant. Rooted (Ex) Slaughtergrass has a complex set of roots that reach 10 feet below the slaughtergrass; the roots allow it to survive complete destruction aboveground part of the plant. As a move action, slaughter grass can detach itself from these roots, but it requires a full round action to reattach to them. Slaughtergrass can survive for 10 minutes away from its root system. If the defenseless roots take damage equal to one fourth the slaughtergrass's hit point total, the slaughtergrass is destroyed. Otherwise, a newly formed plant replaces the "dead" plant in a month's time. A character who succeeds at a DC 30 Knowledge (nature) check knows about this ability. Traveling Weed (Ex) Slaughtergrass that does not kill an opponent leaves dormant seedlings on its foe. While this does no harm to the creature carrying the seedlings, it allows them to travel and infest other locations. A DC 32 Perception check is required to spot the seedlings, which take 1 point of damage to destroy (the seedlings have the same resistances as the parent slaughtergrass). A seedling has a 50% chance to find purchase in soil and it becomes a full-grown slaughtergrass in two months. Some weeds are a nightmare just to remove, but slaughtergrass takes this nightmarishness to a new level by slicing apart and strangling anyone who tries to remove it, or, for that matter, just shows up within range of its tremorsense. A carnivorous plant, slaughtergrass uses its natural camouflage to lure unsuspecting creatures into its midst before striking. A target that thinks it can simply move to safety receives a rude surprise when the grass uproots itself to continue stalking its prey. Slaughtergrass survives in any environment that supports plants, and it will not crowd out its plant neighbors, especially since the additional plants help the grass look natural. In order to propagate itself, the semi-intelligent weed permits a victim or two to escape while carrying several seedlings that eventually drop off the creature and grow into a new patch of slaughtergrass. Slaughtergrass also uses its seedlings to attract otherwise unreachable birds that land in the grass to feed on the seedlings, only to die horribly instead. While the origin of slaughtergrass remains a mystery, most sages postulate that an evil or insane druid cultivated the plant to protect his or her home and allowed it to spread as a preemptive strike against those who would despoil nature. The grass features in many druid groves where the owners care nothing about the animals or humanoids that might blunder into the groves. Even benevolent druids are reticent to kill slaughtergrass and prefer to relocate the plant, but they will destroy it if it poses an immediate threat.